After a good two years of use, my Xeros tend to be my go-to huarache for day-to-day walking around the city in good weather, if and when I'm not going barefoot during the day. I have the originals, the 4mm, which are the thinnest huarache available, that I know of, now that Lunas make all theirs thicker. The thin shoelace laces work fine, just as well as any of the leather or hemp laces I've tried on other sandals. No slipping, and no having to stop and re-tighten them. They may fray a little quicker, but are easily replaceable (I haven't had to yet though), whereas my hemp laces (which I won't even use anymore) and leather laces have all worn through and broken off at the toe hole. And, I'm not into this myself, but the thin lace makes for easy decoration with beads. As for running, I use my thin Xeros for either short runs on the very gravelly trail of Forest Park in Portland, when dry, and on my longer 17 mile loop down to Sellwood and back along the paved bike trails—that is, I'll run most of is barefoot, and carry the Xeros rolled up in one of my drinking bottle pouches (which with the thicker huaraches I wouldn't be able to do) and then slip them on at about the halfway point, where, one, my feet are getting a little raw, and two, the bike trail pavement gets really (and unusually) rough. Also, in mid-summer, in Portland, the blacktop can just get really hot—I got blisters on one section when trying it barefoot. The Xeros give just enough protection. The ways I've chosen not to use Xeros are for city marathons (because I just run those barefoot), and for trail marathons, where I either have worn VFFs, or my thicker Lunas, only because I happen to own them already, and where I just like I little be more protection, in case of bad gravelly areas (though Xeros also come in thicker-soled versions). If you're new to longer runs, like marathons, and want to run them barefoot but just aren't sure you can make it, a pair of thin Xeros rolled up somewhere on your bat utility belt would offer a great 'just in case' option. The one thing Xeros are not good for, and this is true of all my huaraches, is running in wet weather: the rubber just gets slippery with any kind of wetness. Even on sunny days after a rain, if the trail has any kind of mud or puddles, and the huaraches get dipped in them, I find my feet slipping. Huaraches, maybe no surprise, are far better for dry, especially desert conditions. For wet weather running, my recommendation is still the Vibram Five Fingers (see upcoming review). At night, and in cooler wetter weather, I tend to wear my Minnetonka moccasins for day-to-day walking around the city. They have the advantage of being somewhat socially acceptable, and they slip off real easy. (See upcoming review). But for comfort, and having the feet in the open air, nothing beats huaraches. At about half the price of Lunas, Xeros are the far better buy. Again, the Xero company also offers a thicker 6mm sole, and now have an elastic better-gripping lace similar to Lunas', though I have not tried it. I will though. The next time I need to buy some huaraches, either thinner, or maybe for something a little bit thicker (for longer dry runs, and/or hiking/backpacking) I will buy Xeros. Link to my previous review (and most popular!) comparing Xeros and Lunas here. 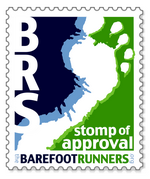 An interesting analysis of a 2013 survey on barefooting I just came across through the Barefoot Running Society website (thebarefootrunners.org). There is a new one, for 2014. Time is running out to participate! Go here to take survey. Image above is to the question: Do you like wearing shoes?